And now it's time for your feel good story of the day. It's about robots, too! Seven-year-old New York boy Devon Carrow is a normal kid, except that he has the kind of allergies that make your occasional cedar fever seem like a walk in the park. Devon is so extremely allergic to a number of foods and chemicals that attending school puts him at the risk of anaphylactic shock. So while his condition prevents him from attending school in person, technology has supplied him with a workaround. Devon now goes to classes remotely through VGo, a four-foot-tall remote controlled telepresence robot, according to ABC News. Devon's face is transmitted onto a screen on top of the robot. He sees what it sees and controls it from a computer in his bedroom. Through it, teachers ask him questions and he chats with his classmates in the hallways. Previously, Devon had a tutor who came to his house, but the robot lets him have that interaction with others that is so vital for young kids. Devon's mom said the robot has given him a purpose and has helped drive him to study harder. This isn't the first time a VGo has enabled a person to attend class remotely. 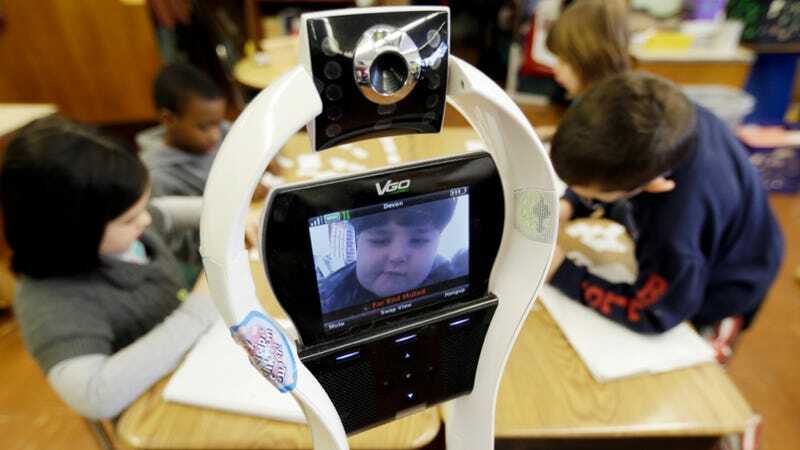 A teenager in Texas with a severe immune system disorder also used the robot to attend school. And at $6,000, the VGo is quite a bit cheaper than similar robots.